Castillo de Montjuic is an 18th century castle that sits atop the Montjuic hill in Barcelona. The original structure of the castle was built in 1640 during the War of the Segadors in resistance to Phillip IV’s forces. In 1751 and 1779 it was expanded. The castle is now home to the Museu Militar (Military Museum) and offers amazing views of the city below. Getting to Montjuic can be achieved one of three ways, you can walk the hill, you can drive up the hill or you can take the funicular (cable car). Obviously, the funicular is the most fun way of getting to the castle, which allows entrance free of charge. This is not necessarily what you would think of when it comes to castles. You aren’t going to see the inside of a grand palace, but rather a military fortress. There’s not a whole lot to do here except walk around and look at the gardens, the military machinery and the take in the views of Barcelona and the Mediterranean Sea. There is a snack stand where you can buy drinks, sandwiches and other snacks, but that’s about it. The castle has been under refurbishment since 2009 and throughout the various stages, the castle will be used for various functions from training and learning presentations to various other cultural activities. 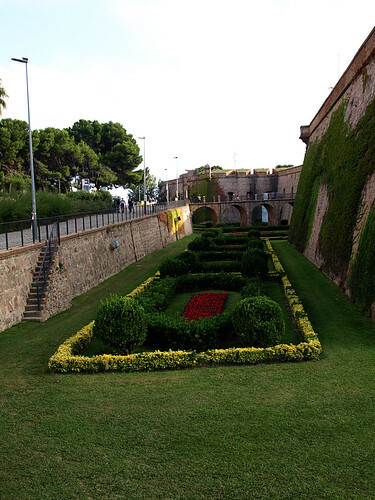 You can learn more about the past, present and future of Montjuic at Castell de Montjuic – Ajuntament de Barcelona. 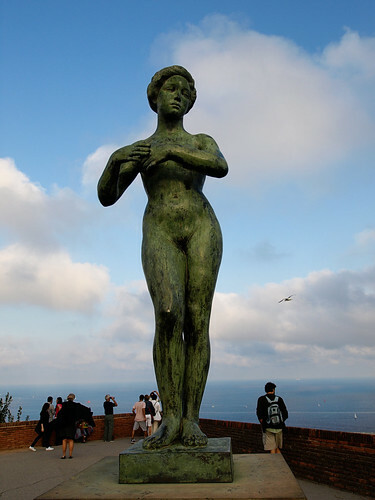 This is a definite must see in Barcelona for the views alone. Just beneath the castle on the hill you will also find the Magic Fountains (which were unfortunately closed when we visited Barcelona) as well as the art museum, where, when we visited had tons of people waiting for the Magic Fountain show to start that never started. Other than that bit of disappointment, we enjoyed Montjuic.